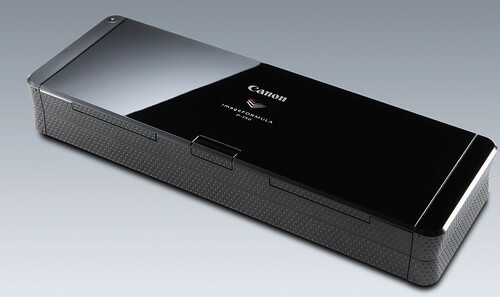 Canon claims this chunky little scanner is the fastest portable A4 model on the market - and it can scan both side of the page and feed up to 20 pages automatically.The p150 is portable - but not that portableGetting the full speed means plugging in two USB cables; if that's awkward you can just plug in the one to the power socket but that will slow scanning down. 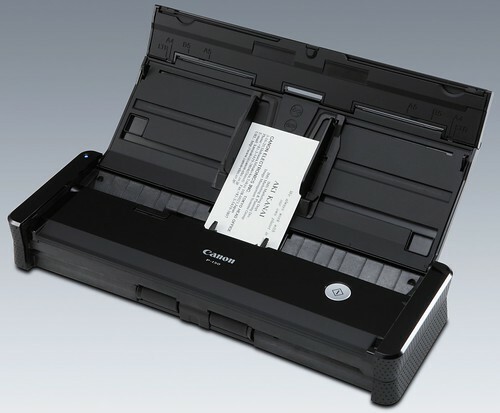 Canon claims this chunky little scanner is the fastest portable A4 model on the market - and it can scan both side of the page and feed up to 20 pages automatically. Getting the full speed means plugging in two USB cables; if that's awkward you can just plug in the one to the power socket but that will slow scanning down. Something else that gets you started quickly is the fact that the scanner has Canon's CaptureOnTouch Lite software built in, so you don’t even need to install a scanner driver (although the CD includes CaptureOnTouch, which lets you save multiple scanning setups and open scans directly in applications, as well Presto! BizCard Reader, an OCR tool for scanning business cards into your address book, and PaperPort document management software). The AutoStart button on the back of the scanner switches between scanning into CaptureOnTouch Lite or working as a TWAIN scanner with the application of your choice (so you can use it with more powerful software on your main PC but still do quick scans on any other PC). If you leave AutoStart on you can connect the P150 to your PC and the driver installs automatically; changes to AutoPlay security in Windows means you probably won't see the option to run the software from the AutoPlay window but you can click to open the scanner in Explorer and run the app from there, and you can start a scan by pressing the button on screen or the button on the scanner. You can change plenty of settings in CaptureOnTouch Lite but the defaults work well for documents and with both USB cables connected, scanning two single-sided letters took about ten seconds (the pages feed through more quickly but that's the time to see the scans on screen and ready to save. The 200dpi default gives you readable documents that are automatically straightened even if you put them in at an angle and the document feeder has no problem with pages that have been folded (even pages that wouldn't lie flat and credit card statements that flopped over the back of the feeder scanned without problems, even if we didn't lift the support arm built into the lid). 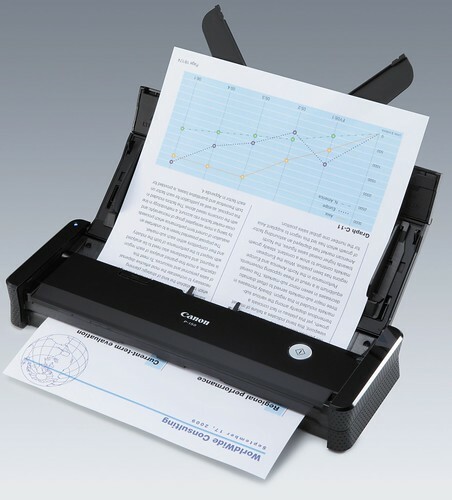 The only confusing thing is that you need to put pages upside down into the feeder to have them scan right way up; once you do that, the other side of the sheet is rotated automatically in the scan, and the preview has a button for rotating pages. For a couple of pages you don't even need to open the document guides, but if you want to scan more sheets at once, flip them up to stabilise pages or they will scan crooked (the guides also slide in to hold business cards securely for scanning). The 20-sheet feed can take 20 sheets of paper but thicker sheets of paper tend to stick together if you scan 20 pages at once (the same pages scanned one by one correctly when we only put ten sheets in at once and 20 thinner sheets of paper did scan one by one as well). Scanning is so fast that doing ten pages at a time instead of 20 takes very little extra time. 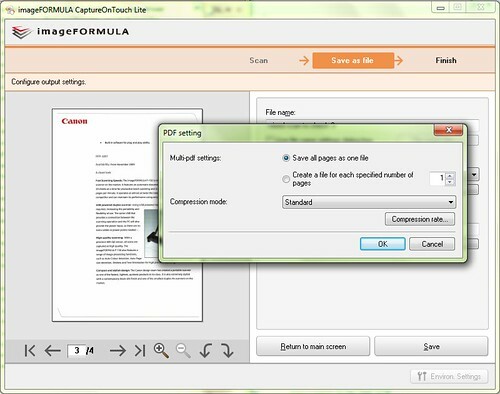 The options for saving files are also more sophisticated than just automatically generating file names based on the date; for PDFs and TIFFs you can scan all the pages in a batch into a single file or create multiple files with as many pages in as you want (so both sides of a page can go in the same, separate PDF).